Learn about Salesforce Government Cloud Wave. The Salesforce Government Cloud Wave, powered by Wave Analytics, gives all knowledge workers the modern, mobile, self-service analytical tools they need to ask questions, resolve issues, and advance the mission. Learn about the features and key capabilities that bring this FedRAMP approved cloud BI tool to life. 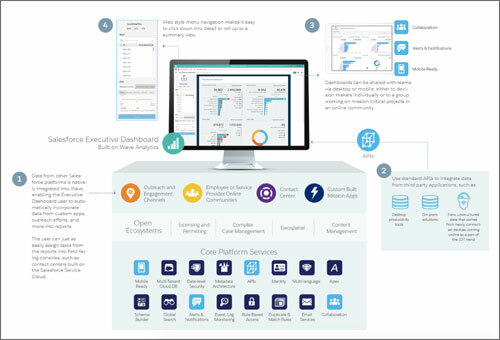 The Salesforce Executive Dashboard, powered by Wave Analytics, gives all knowledge workers the modern, mobile, self-service analytical tools they need to ask questions, resolve issues, and advance the mission.